If you can’t beat ’em, join ’em—even if it’s 11 years after the fact. Devlin’s Bill Godin and Dave Lindsay of Kenora are the team to catch after Day 1 of the 2016 Fort Frances Canadian Bass Championship after hauling in 17.36 pounds. It was the lowest Day 1 leading total at the FFCBC since Lindsay and his brother, Norm, brought in 14.62 pounds during the tourney’s inaugural year in 1995. Lindsay, who won the tournament twice with his sibling in 1995 and 1997, also paired up with his father, Lee, for his most recent title in 2005. The runners-up that year? None other than his brother and Godin, a four-time Emo Walleye Classic winner gunning for his first FFCBC crown. Another veteran Devlin angler is hot on the heels of the leader. Paul Jewiss and teammate Brian Wick (Saint Michael, Mn.) sat in second placed just .20 pounds back of top spot (17.16). With nobody else breaking the 17-pound barrier, third place belonged to the rookie team of Ian Waterer (Winnipeg) and Chris Viel (Thunder Bay) after they bagged 16.83 on Day 1. Rene Cadene of Atikokan and his brother, Morgan (Cranbrook, B.C. ), originally were over the 17-pound mark when they weighed in. But a .25-pound penalty for having one dead fish out of their five knocked the siblings down to 16.77—putting them in fourth place. Bryan Gustafson is the leading Fort Frances-based angler after Day 1 as the 2014 runner-up paired with Brian McNanney (Kenora) to bring in 16.75 pounds to sit fifth. The Thunder Bay duo of Kevin Ritchie and Kyle Huillery were in sixth place (16.62), followed by a tie for seventh between the Fort team of Denis Barnard and Scott Gobeil and the tandem of Matt Christy (Superior, Wis.) and James Chapman (Duluth), who each had 16.54 pounds. Rounding out the top 10 were the International Falls duo of Bill Walls and Jason Paveleck (16.52) and the 2001 champs in Fort brothers Steve and Kent Ballan (16.31). A total of 99 teams left the Sorting Gap Marina yesterday (five teams scratched out of the original 104). As the reigning title-holders, the brothers had the honour of being the first to head out on Rainy Lake yesterday morning. But only two miles into their trip, the Sandbergs were adrift in a tidal wave of bad luck as a blown motor cost them two valuable hours of angling time while they waited for a replacement boat. The result was a shorter day to make hay, which led them to only net 12.54 pounds to wind up in 60th place—virtually eliminating them from contention before today’s action even got started. As captains of the Stars-and-Stripes contingent in the inaugural Canada vs. U.S. competition at the FFCBC, the Sandbergs’ misfortune was part of tough day for the Americans that has them well back of their Canadian foes by a margin of 80.94-67.75 pounds. With Godin and Lindsay, the Cadenes, and Barton and Gobeil all cracking the top 10 yesterday, Team Canada captains Duane Cridland and Chad Hanson of Fort Frances looked shrewd in their selections. Cridland and Hanson, second at last year’s FFCBC, also had a solid day yesterday by coming in 15th (15.94) while Thunder Bay teens Nick Vescio and Mitch Siciliano landed 30th (14.33). That still was a higher placement than three of the five American teams. Chad Johnson (Rogers, Mn.) and John Janousek (Nisswa, Mn.) didn’t even crack the top 20 as the best U.S. duo yesterday, coming in 21st (15.24). The two men they finished second to in 2012, Mark Raveling (Longville, Mn.) and Mike Luhman (Deer Park, Wis.), managed to place 27th (14.81). But the Sandbergs’ woes hurt the U.S. chances, as did tough days for 2011 co-champs Richard Rud and Jon Austen from the Falls (50th, 13.30) and five-time champions Joe Thrun (Annandale, Mn.) and Jim Moynagh (Carver, Mn. ), who struggled to 72nd place after only netting 11.86 pounds. The big fish of the day belonged to the Fort team of Ryan Hyatt and Karl Wolff, who landed a 4.36-pounder to nose out fellow Fort angler Troy Norman and Kenora teammate Jay Samsal (4.20). The Day 2 weigh-in begins at 3:30 p.m. under the big tent at the Sorting Gap Marina. The final weigh-in goes underway tomorrow starting at 3 p.m.
Devlin’s Paul Jewiss, left, and teammate Brian Wick of Saint Michael, Mn. are right in the mix at the 2016 Fort Frances Canadian Bass Championship after sitting in second place on Day 1 yesterday with a total haul of 17.16 pounds. 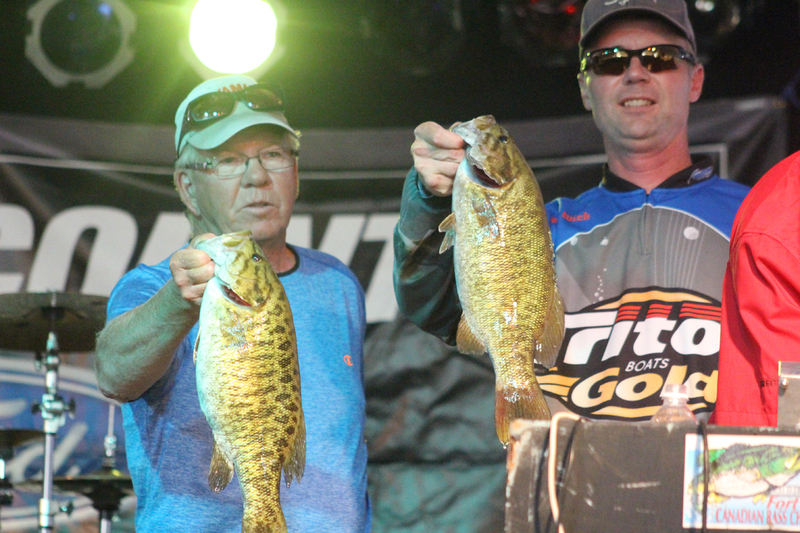 Bill Godin (Devlin) and Dave Lindsay (Kenora) were the front-runners with a 17.36-pound bag. —Joey Payeur photo, Fort Frances Times Ltd.